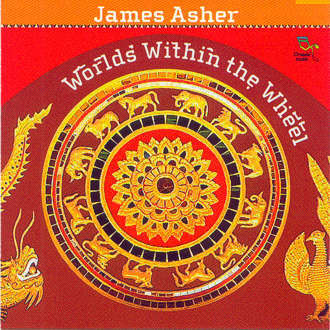 Worlds Within the Wheel displays James Asher’s earlier work, combining traditional, world and modern influences. These tracks have passed the test of time with ease. The full length of The Great Wheel (a symbol of timelessness) invites you to enter the spirit of change, the cyclical nature of life. Credits : Keyboards, composition, programming and production on all tracks by James Asher. Track 3 was jointly written and produced with Acoris Andipa. Track 1 mixed by Grahame Gerrard and James Asher. Tracks 5 & 6 produced by Philip Bagenal. Recorded at Eastcote Productions and at Lumina Studios, London, England. Tracks 1-4 published by Three Kettles Music. Tracks 5-7 published by Stuio G. Cover by James Asher & Rory Baxter.